I'm standing awkwardly in front of Lily of the Valley, phone in hand, patrons on the terrace eying me critically. 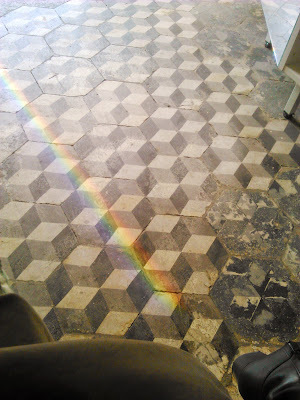 Light streaming through the window projects a rainbow on the patterned floor. 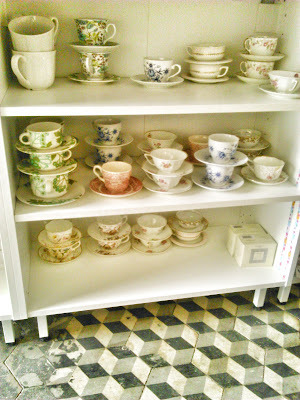 A server rushes under the plafond végétal with a silver tray set for tea, brown sugar cubes, tiny spoons, and all. "If you move to the corner, you'll get a better photo. That's where I usually sit," says the girl studying by the window. "Do you come here a lot?" I ask. She smiles sheepishly. 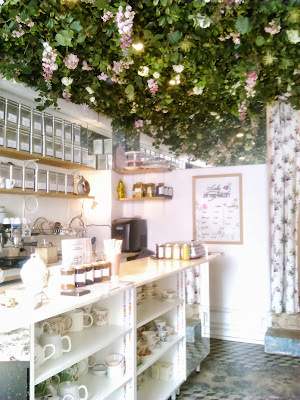 "I only discovered this place a few days ago," she explains, "I've been several times already..."
Lily of the Valley is a painterly, shoebox-sized enclave tucked away on Rue Dupetit-Thouars, down the street from Ofr and Fondation Cafe. 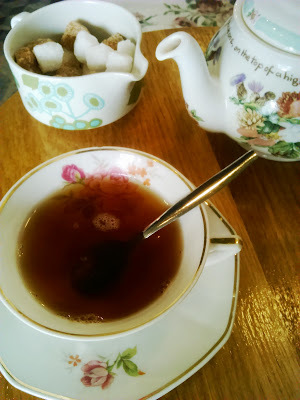 For those cleaving to the primacy of Camellia sinensis, Lily of the Valley is a veritable Marais gem. 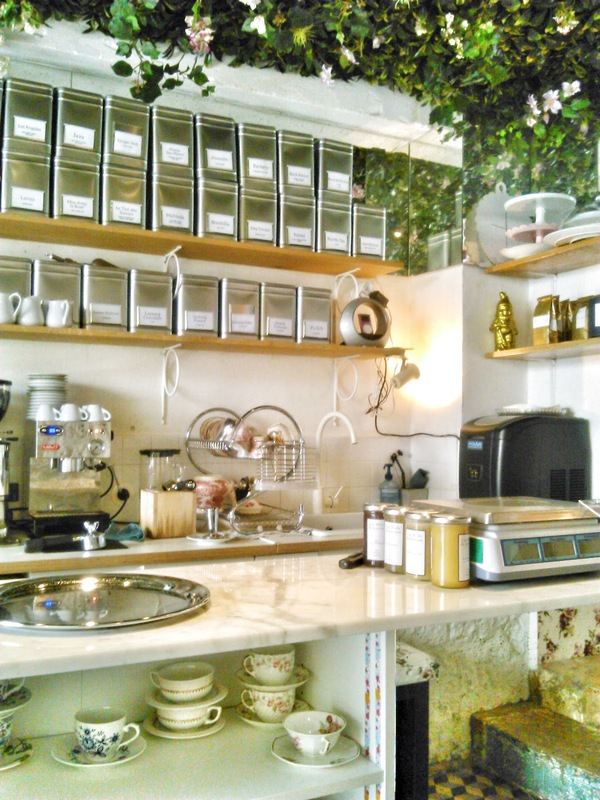 Stacks of delicate porcelain and gleaming metal tea boxes line the shelves. Mismatched chintz prints cover the comfy bench and sparkling bathroom. 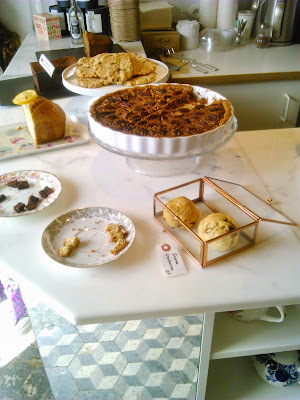 Outside, enjoy gluten-free patisserie, prepared in-house from organic ingredients, on pristine white bistro sets (the owner, Pauline, is dedicated to gluten-free cuisine). 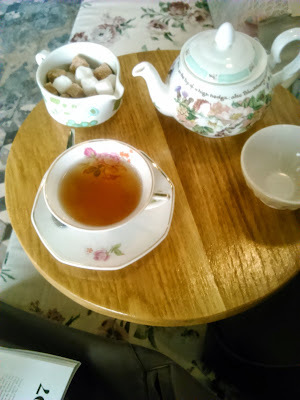 I've heard good things about the scones and thé glace- survey says their coffee is excellent. 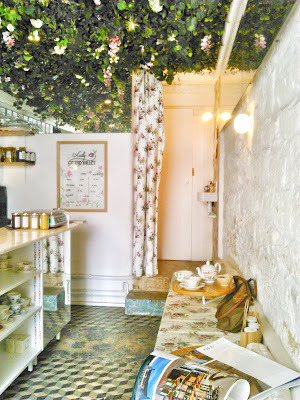 Conceived by Pauline, designed by Marie Deroudilhe, this bucolic tea bar- a Paris' first- is part Elsie de Wolfe, part Lewis Carroll, stocking smartly named organic offerings made in France. Craving whiskey? Order the Lapsang crocodile. Feeling anarcho-pacifistic? Try the Tolstoi. 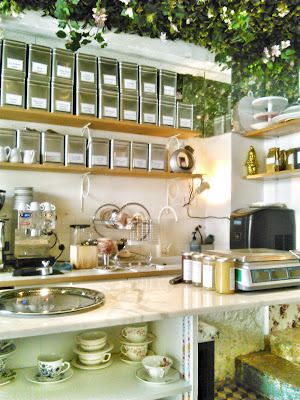 Lychee, pink peppercorn, wild strawberries and arôme Blanc mousseux dress up black and green teas; I love the chocolate laced maté and Bonne Humeur infusion (marjoram, verbena, rose, cacao nibs, and poppies, among other delicious volatile botanicals). The scale on the polished counter awaits container tares and bulk tea. No paper napkins or plastic disposables here! The bilingual staff is unfailingly nice, and when I asked a server where she got her sweater- appliquéd with a single colorful wing of interlocking leather scales- she not only shared the brand, she drew me a little map (Le Bestiaire Volatiles*, Rue Commines). 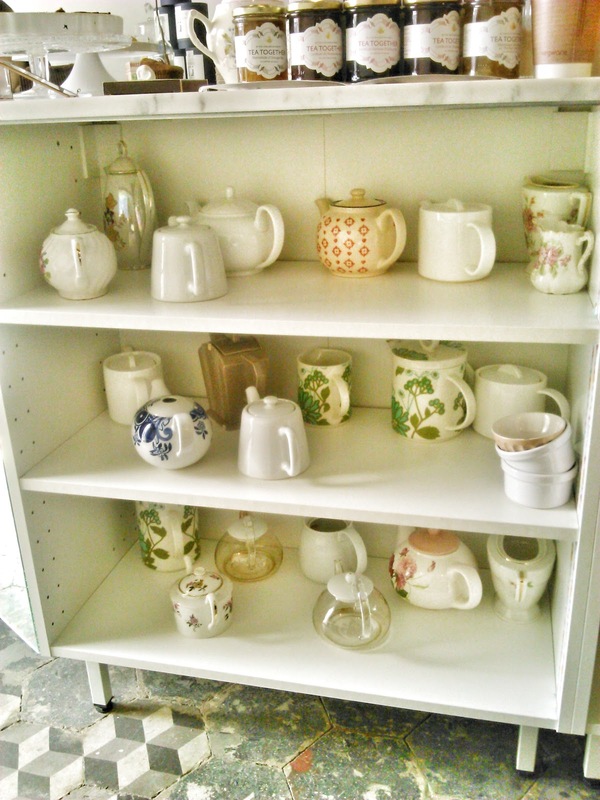 It's not just for bobos, either. 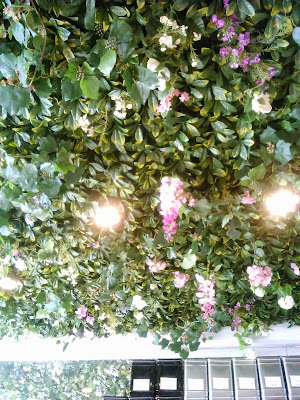 Lily of the Valley attracts an international crowd encompassing everybody from students to local young professionals to lifelong Parisian retirees. I wear dress clothes there and feel right at home- no amount of Jeremy Scott and American Apparel could ruin this place for me. Thank you for sharing this beautiful place! I would love to see it in person. Studied in Paris six years ago and meaning to go back..... you have a unique take on the city. I love your life! Hi Maia, thank you! I hope you do come back. Everyday I find new things I love, I can't keep up with writing about them all!